In the hopes of building international relationships one music fan at a time, St. Scholastica will host a concert with a global flair at 7:30 p.m. Saturday, Oct. 1. 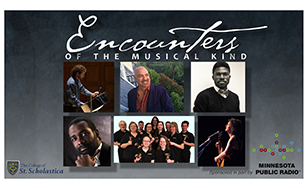 The Duluth Sister Cities 2nd Annual Concert: Encounters of the Musical Kind takes place in the Mitchell Auditorium on campus. The Duluth Sister Cities initiative is based on the idea that true understanding between people and nations begins with individuals. Duluth has "sister city" relationships with five cities: Thunder Bay, Canada; Vaxjo, Sweden; Petrozavodsk, Russia; Rania, Iraqi Kurdistan; and Ohara-Isumi City, Japan. Under the direction of singer-songwriter Sara Thomsen, the concert will feature talented area musicians who showcase a variety of musical styles. Tickets are $27 for adults and $15 for students, and are available through the Mitchell Box Office at 218-723-7000, spotlight@css.edu, at spotlight.css.edu or from Duluth Sister Cities board members. Performers will include Thomsen, the Strikepoint Hand Bell Choir, percussionist Jeremy Craycraft, classical baritone Elias Mokole, hip-hop artist Daniel Oyinloye and classical violinist Jean R. Perrault. Audiences will have the chance to enjoy many musical styles, including classical, opera, hip-hop and folk. There will be spontaneous improv, percussive play and ancient songs, combining for a playful and profound performance.